For my final project in physical computing, I wanted to follow through with one of my pre-ITP goals to accomplish during the program, which I outlined in an older blog post. I wanted to build an inventory system which used RFID/wifi/whatever to check stuff in to boxes, so that when I needed to find something, I could pull it up on my phone or in a browser and ask it where it was, and the box it was in would glow with LED light. At the same time, these boxes and things would become individuals and traits, respectively, that I could add to or subtract from to create objects with personalities. Tjan opened the door with a flourish and she stepped in and stopped short. When she’d left, the place had been a reflection of their jumbled lives: gizmos, dishes, parts, tools and clothes strewn everywhere in a kind of joyful, eye-watering hyper-mess, like an enormous kitchen junk-drawer. Now the place was *spotless* — and what’s more, it was *minimalist*. The floor was not only clean, it was visible. Lining the walls were translucent white plastic tubs stacked to the ceiling. She pulled a couple of the tubs out. They were jam-packed with books, tools, cruft and crud — all the crap that had previously cluttered the shelves and the floor and the sofa and the coffee table. “Watch this,” he said. He unvelcroed a wireless keyboard from the side of the TV and began to type: T-H-E C-O. . . The field autocompleted itself: THE COUNT OF MONTE CRISTO, and brought up a picture of a beaten-up paperback along with links to web-stores, reviews, and the full text. Tjan gestured with his chin and she saw that the front of one of the tubs was pulsing with a soft blue glow. Tjan went and pulled open the tub and fished for a second before producing the book. “Try it,” he said, handing her the keyboard. She began to type experimentally: U-N and up came UNDERWEAR (14). “No way,” she said. “Way,” Tjan said, and hit return, bringing up a thumbnail gallery of fourteen pairs of underwear. He tabbed over each, picked out a pair of Simpsons boxers, and hit return. A different tub started glowing. He did, too, losing all of the shyness she remembered, his eyes glowing, his sausage-thick fingers dancing. “Have you ever alphabetized your hard drive? I mean, have you ever spent any time concerning yourself with where on your hard drive your files are stored, which sectors contain which files? Computers abstract away the tedious, physical properties of files and leave us with handles that we use to persistently refer to them, regardless of which part of the hard drive currently holds those particular bits. So I thought, with RFIDs, you could do this with the real world, just tag everything and have your furniture keep track of where it is. “One of the big barriers to roommate harmony is the correct disposition of stuff. When you leave your book on the sofa, I have to move it before I can sit down and watch TV. Then you come after me and ask me where I put your book. Then we have a fight. There’s stuff that you don’t know where it goes, and stuff that you don’t know where it’s been put, and stuff that has nowhere to put it. But with tags and a smart chest of drawers, you can just put your stuff wherever there’s room and ask the physical space to keep track of what’s where from moment to moment. Perry slapped him on the shoulder and Tjan drummed his forefingers like a heavy-metal drummer on the side of the workbench they were gathered around. “OK, this is pretty perfect,” Suzanne said. The clutter was gone, disappeared into the white tubs that were stacked high on every shelf, leaving the work-surfaces clear. But Lester’s works-in-progress, his keepsakes, his sculptures and triptychs were still out, looking like venerated museum pieces in the stark tidiness that prevailed otherwise. I kind of read into the book a post-Apple world, where the production process has become so hyper and quick in order to account for gadgetphiles’ fickle tastes that smaller ideas are put into mass production, that grand visions are no longer marketable in a soon-enough timeframe. What we’re seeing today is the democratization of hardware, following in the shadow of software’s reign, which has dominated the last 30 years or so. With lots of small shops now selling microcontrollers, Radio Shack retooling its stores to sell circuitry components once again, and the advent of the internet of things and sensor-based objects that are learning how to sense the world around them, our world is going autonomous. Think military drones, but on smaller scales and for more common-day applications. This will probably obsolete RFID, but right now it’s not quite cheap enough for usage in the same way that the ID-12 and other RFID readers are. Its security is an improvement upon RFID though, so it will likely win for more complicated applications. I’d love to continue doing projects related to presence, identification, and communication using these techs though. Another classmate (and make: contributor) Matt Richardson sent me this project, “Doh”, which uses RFID and Arduino to help you remember your wallet and keys before heading out the door. Here is a sketch I drew for what I want to build, along with some of the components I already ordered to make it work. “EL tape” in the top-right should read “digital RGB LED strip”. I bought both but ended up just using the digital RGB LED strip. I’d love to have a tour of some of the tech behind Walmart’s and UPS’s logistics systems, which reportedly make use of RFID to help with real-time inventory. The breadth of data and the information that they must be able to extract from it all is staggering to think about. My system was only composed of two working boxes though, since it gets rather expensive quickly to get wifi-capable microcontrollers (I got Diamondbacks from cutedigi), RFID kits, some RFID stickers, digital RGB LED strips (to make the tupperware boxes I’ll get to glow), 4AA battery packs from Radio Shack to power the microcontrollers, and other assorted power connectors. I also got some LED screens in case I wanted to do some interface stuff. The tupperware I bought at KMart. I had to order plastic PVC ID cards off Amazon.com, as they are surprisingly hard to find in town (Staples didn’t even have them). Maybe they are a somewhat controlled item because people use them to make fake IDs? Now, having never played with any of these things, and having never done a physical computing project of this magnitude, I was fully expecting that I would have pieces that wouldn’t work with each other (I’m worried about the cards/tags/stickers and RFID readers being compatible), and that I may have had to buy MORE stuff. I chose this project because I thought it’d be doable, given my experience and the capability of the hardware. What I wanted to do is just prototype a simple inventory system where each box has a scanner that lets me “check in/out” objects on an RFID reader, which then passes the data over wifi to my server, which then displays a nice PHP script showing where stuff is. If I want to find something, the PHP script asks the box that contains it to light up. That’s about it. And maybe, if I had enough time, I could let the boxes talk to each other in some silly way. If I had time. And if things didn’t blow up in my face. 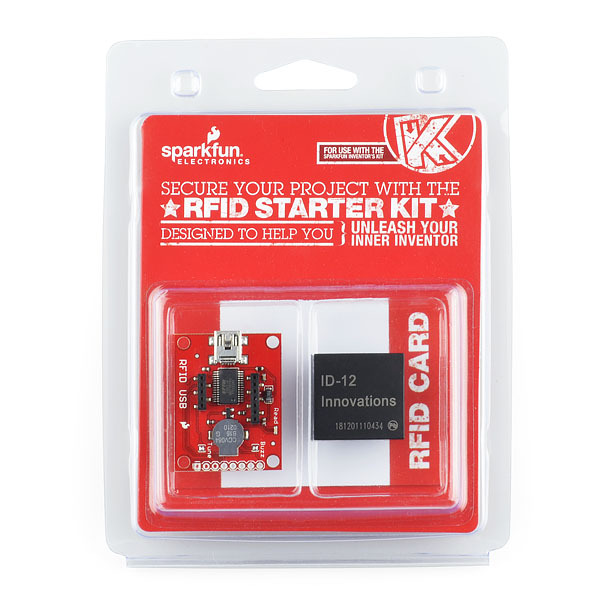 I bought a couple RFID starter kits from Sparkfun, which include 2 ID-card sized 125KHz cards, an ID-12 RFID module, and an RFID reader breakout board. 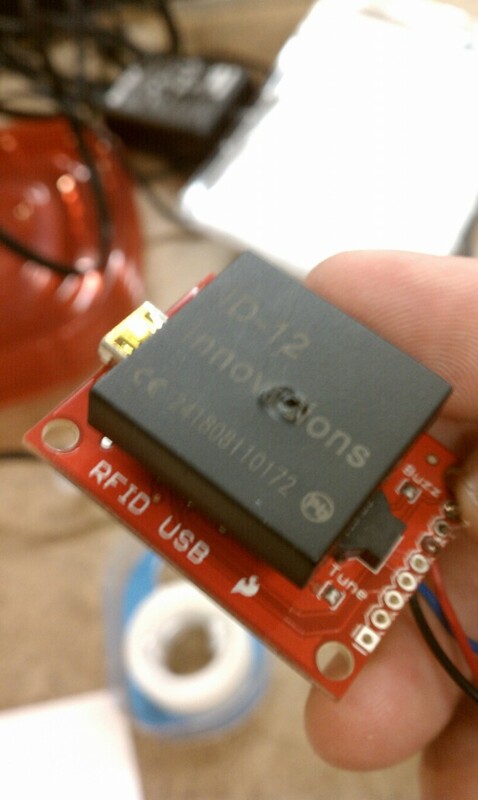 I tested the RFID readers by just plugging in a mini-USB to USB cable I bought from cutedigi. Those read fine, displaying the RFID card codes into the ZTerm modem comms app for OS X. That working, I then tried to get the reader to work when connected to my Arduino Uno, using the code posted by Nick Gammon on the Arduino forum. Soldered wires to the VCC (5V), GND (ground), and TX. Made sure to not have the TX wire attached to the RX pin on the Arduino while uploading the above sketch. Then, success! Successful reading of RFID numbers to Arduino’s serial monitor! My next task was to get my LPD8806 digital RGB LED strips to work with my Arduino Uno. Several other students had worked with the strips for their physical computing projects, so I got some good tips on what transistors, shields, etc. to use for EL tape and EL wire, and what pages to look at. Lady Ada’s guide was invaluable. It looked like the RGB LED strips have the potential to draw way too much power for a portable solution. I was worried I might have to go with EL tape or wire as potential solutions, which provide less visual feedback to the user (the RGB LED strips have individually addressed LEDs that you could make any color and thus give the user visual cues). At that point, I also started considering what other components could provide feedback. I wasn’t too happy about using individual LEDs — I thought that might look sloppy. And a wave shield for playing sounds has its own host of problems: you have to solder the kit yourself, the shield would be inside the box so the sound would be muffled, etc. I had ordered 2 meters of the LPD8806. I unsoldered the first meter from the second as instructed by Limor’s (Lady Ada) guide, by peeling the strips apart as I heated them up with a soldering iron. Then I soldered wires onto the input connections on the strip. I was most nervous about getting the LED stuff to work, but they already came with a library with examples to command the LEDs how I wanted; the hard part was figuring out the power and wiring. 4 AA batteries worked fine, when connected with the Arduino and running whites on each LED (though I wouldn’t want to keep it that way, lest it burn out or be underpowered). Where I ran into trouble later was when I wanted to run the RFID reader as well; the power draw coming off the LEDs while also running the wifi and RFID code was too much — not enough juice? I was excited about creating color moods for the containers to represent their feelings, and I was looking forward to a beautiful fade-in, fade-out cyan for when a box says it contains an object I want. I bought two Diamondbacks, which are basically ATmega328 chips on Arduino Duemilanove boards with on-board wifi (supporting open networks, WPA, WPA2, and WEP…a key bonus for accessing the multitude of networks out there) on recommendation from my classmate Gavin and my prof, Scott Fitzgerald. I was a little worried about getting this part working because wifi is still a little sketchy and undocumented in Arduino-land. I spent hours upon hours downloading different peoples’ libraries and looking through the Arduino.cc and linksprite and asynclabs forums and docs. I even looked through the Chinese linksprite files, which was painful. But the example sketches I was trying wouldn’t compile! I asked Gavin, a classmate, for help and he mentioned that he was using Arduino version 0022, whereas I was using the latest version, 0023 (RC beta 3). I downloaded 0022 and the sketches started compiling! Not too long later, I managed to connect my little Diamondback to my WPA2 router! Get a git clone of the user-contributed WiShield Arduino library from asynclabs. Install it to your Arduino sketch folder in “libraries/”. Edit apps-conf.h so that only one “APP_” define is uncommented. For the client-based example sketches (like SimpleClient), uncomment “#define APP_WEBCLIENT”. If things don’t compile and you get weird errors, try a different Arduino version. I had to install Arduino 0022 to get my Diamondback to work. Opening .pde sketches in Arduino 0023 will cause them to be renamed to .ino, which 0022 won’t see. 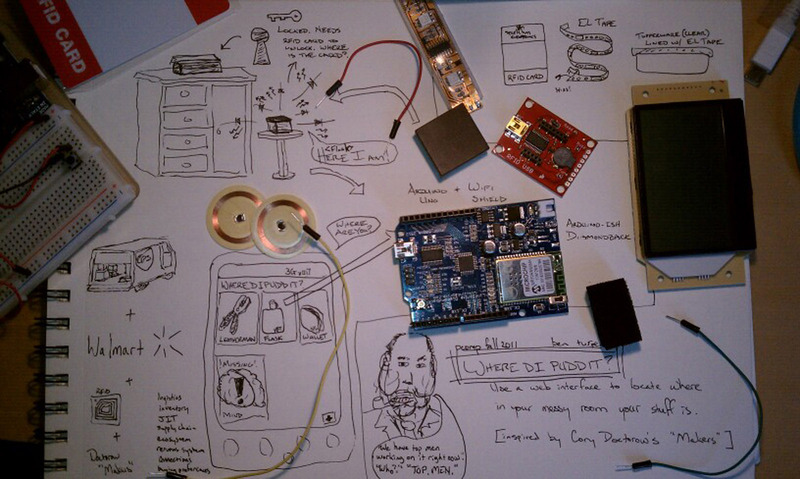 So you’ll have to go back and rename the sketch and re-open Arduino 0022 to see it again. I think I had to go track down wire.h on the interwebs and save it as wiring.h because it was missing for some reason, giving me a compiler error message. Make sure you set a static IP on your router for the wifi device to connect to — it can’t handle DHCP. What a headache to get all that working! The forums were not very descriptive or helpful for getting this to work. I had to combine that code (which lets me GET a string of variables to a PHP web page, which can then be passed into a MySQL database, with two other pieces of code: code to read in the RFID ID # via serial port (which I did above), and code to poll the web server to see if the server is instructing it to light up the LEDs or not. I was really, really, really hoping this is a smooth process. I set up the database and front-end for the web server. I set up a few tables, one for my list of things, one for my list of containers (I made things and containers separate because I’m thinking some things might also be containers), one for a log tracking what events have happened. Now I’ve got a pretty slick interface, though I might need to restructure the MySQL pulls into PHP classes instead of one-offs. I also might need to restructure the data so that not everything is given away in my source’s JSON. There’s a ton of work I need to do adding functionality for things like having the web server tell the Arduino to turn on its LEDs, etc. But the basic layout is done! You can try out the Wheredipuddit interface on my web server. It’s not connected to anything though. These pieces all worked fine on their own. It came time to put them all together. This is when I started running into issues. First of all, I was wrestling with the code to send the GET request. The sample Arduino code that connected to a weather database worked. My PHP script to read an HTTP URL into a MySQL database worked. But when I tried to modify the Arduino sketch so that it could insert a different RFID based on which one was scanned, and then requested through the Arduino, I’d often get Arduino resets. My professor suggested that I stop trying to mess around with char pointers (char *) and arrays, and just hardcode in the URLs based on if..then checks for which RFID was scanned. This worked with one example but for 20, it also reset the board. I suspected I was filling up the memory on the Arduino or something. I reduced the number of if..else if..then checks to just 3 different RFID tags, and that seemed to work okay. 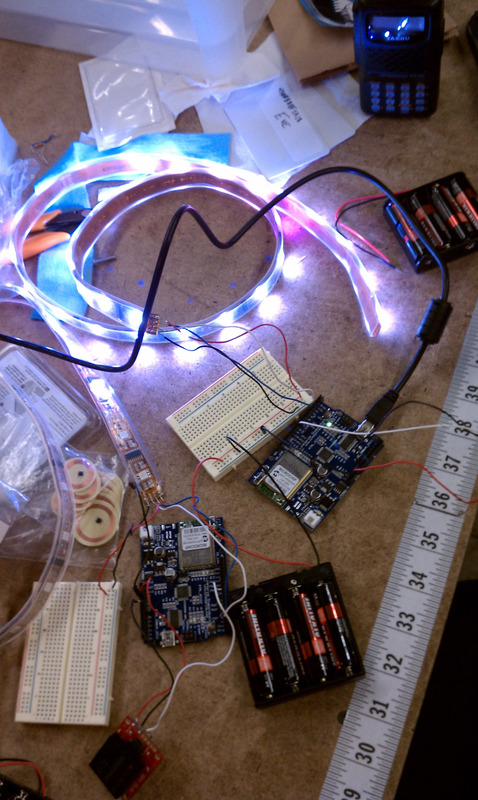 I then added the digital RGB LED strips. With the way I wired it up, everything was drawing from the same power, and I’d get the Arduino to work fine, but when I scanned the RFID reader, it would click (not enough power, or a short circuit), or the LEDs wouldn’t come on. I ended up getting another 4 AA battery pack and connecting it to the Arduino + RFID, with the LEDs getting their own (but grounded with the Arduino). I’m not sure if this circuit caused later problems — I don’t think it did since I didn’t get any more issues, power-wise. Save for the flimsy battery pack wires. If I had more time, I’d definitely solder the wires to header pins so they’d be more robust to being moved. The wires popped out pretty easily without pins. I added another GETrequest at the end of the loop, which checked to see if the server had changed the box’s mood. The server would just output 1 integer on the ping.php page, which the Arduino would read and then display on the LEDs the corresponding color for the new mood. I blew out an RFID reader after being frustrated and trying a different power setup. I guess it didn’t like being hooked up along a connection tied to a 12V battery pack. Oops. First time I’ve blown out a component. 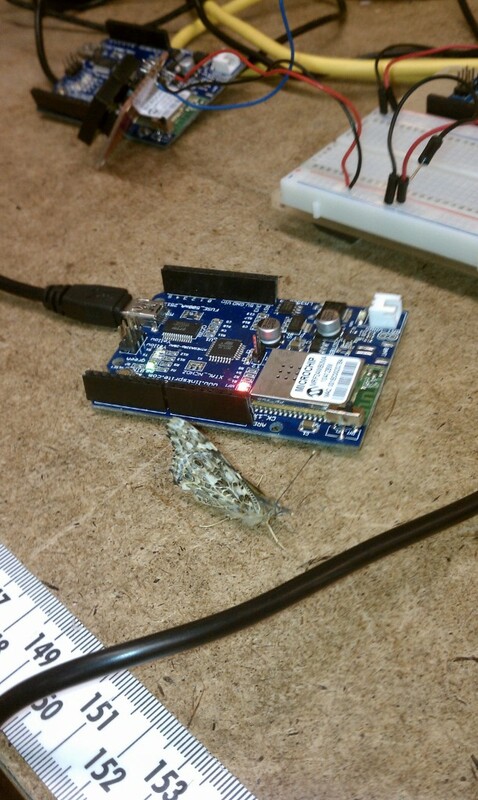 Maybe this was caused by the bug — or butterfly — in my Arduino. I guess the butterfly was from a classmate’s butterfly project (she apparently had butterflies mailed to her). I have a feeling having two GETrequests could have contributed to one of my major issues, which seemed to be flooding the serial buffer. I’d often get the LED 13 light stuck on, as if it was being flooded with data. I did try to serial.flush() my serial connections but that seemed to destroy communications — nothing was logged in my database as having been touched. Other times, I would scan stuff in or try to ping them from my browser (pinging from browser would tell the Arduino on its next connection that it needed to light up to show the user that the requested object was inside), and nothing would happen! When doing serial communications, make sure you try to understand EVERYTHING being passed across. Make sure to always use the serial monitor, just to be sure you’re getting expected results. When doing communications between client and server, always build tons of logging into your code, even at first when you’re just scaffolding the project. You will need to do small unit testing on each case individually to make sure it works, before trying to put everything together. The worst is when you can’t figure out where your problems are being caused, because there’s too much going on and too many points of failure. Keep the network traffic thin so there’s more margin for error. TEST EVERYTHING INDIVIDUALLY. I would have bought an extra Arduino and the new WiShield 2.0 shields, or waited for the new Arduinos with built-in wifi. The problem I had with the Diamondback was that I ended up using poorly documented code that didn’t do what I wanted it to and didn’t seem very configurable, and operated far less usefully than Arduino’s example code in the ethernet library. The WiShield 2.0 code seemed far more user-friendly. What interests me about this is the long-term application. What will it be like when objects can tell you if they’re missing parts, or they can report to you on their health, or they can take out some of the daily logistics planning that we send to our brains’ subroutines every day while we try to get other stuff done? What will the world be like when things start talking to each other outside of the internet? Can I get my boxes to talk to each other while they’re near each other? 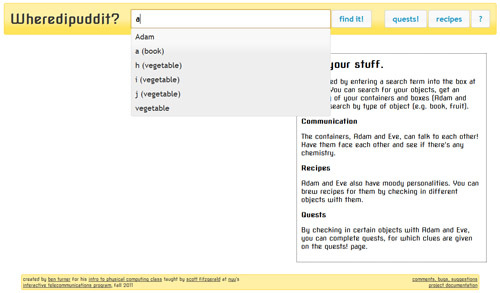 Can I build recipes, like scan a bunch of characteristics (honesty, humor, good looks) into the boxes so that, if the recipe is right for both, they “fall in love”? In talking with another classmate, Tak, we realized that if there were, say, 50 boxes piled against a wall, you could turn them into interactive pixels, controllable via Processing sketches! And as I talked to yet another classmate, Christie, I realized, what if there will be a job in the future for creative storytellers where their job is to imbue objects with personalities? Think of just observing everyday objects talk to each other, all being coded by different people, all with unpredictable and surprising interactive behaviors, with companies competing to hire the most creative people to give their products signature anthropomorphized personalities. I didn’t get my project to work. I thought I’d be able to do it. But I ended up encountering issues at almost every step of the way, with five obstacles popping up once I solved just one. I definitely need a mental break from school now that the semester’s over. I want this idea to work, but I’m going to have to accept that I need to move on from it because I’ll have other class projects to do. But it’s very hard for me to leave a problem unsolved. So it’s been gnawing at me. But I’ll be using the break to forget about it, and try not to come back and try to figure out what’s wrong with it. At least for a while, or until I can use the project for another class or application. Sigh. * Chopped together from various sources. // Packet structure, see ID-12 datasheet. // If the last character of the packet is 3, move on. // sparkly and almost random, but actually follows a specific order. // any pixels off the ends of the strip, no worries there. // and draw a new one next time.